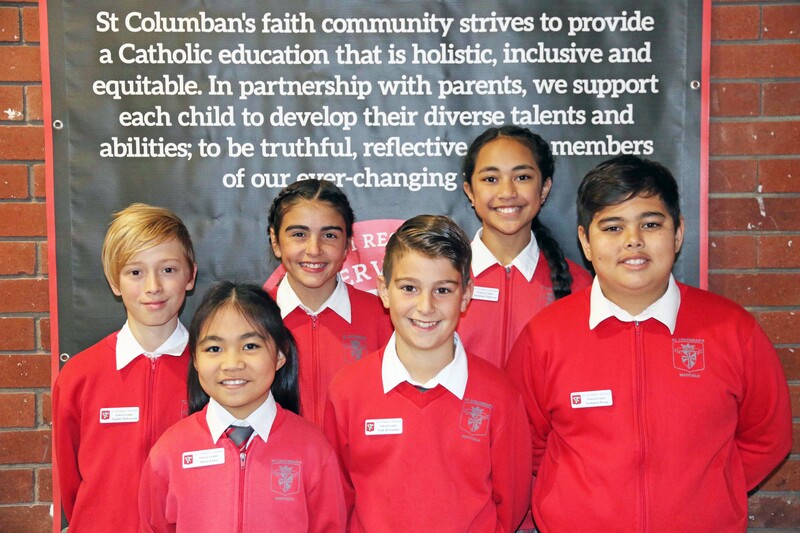 St Columban’s aims to provide opportunities to develop and cultivate leadership qualities within all students. We aim to instil in students, a strong sense of social justice through the service of others. Students from Year 5 are all eligible to become school leaders for the following year. Interested students present speeches at the end of the school year and leaders are elected from these speeches. Early the following year, House Captains are elected after making a speech to their colour house. The new school leaders are acknowledged at the end of year Mass and badges are presented to all leaders at the opening school Mass the following year. The leaders perform a number of ceremonial roles on special occasions. They meet and liaise often with the Stage 3 teacher and principal. The leaders are responsible for setting a good example of being responsible, respectful, safe and ready to learn at all times. They have responsibility for the care of sports equipment, maintaining house enthusiasm in sporting activities, representing the school at community functions as well as school based activities. The leaders see a major part of their role to be problem solvers and forward thinkers. The leaders run the Mission Day activities throughout the year and other social justice initiatives as they present.